Citi Bike’s first station in Queens is now up and running, with 90 more coming to Long Island City, Greenpoint, Williamsburg, and Bedford-Stuyvesant by the end of August. It’s Citi Bike’s first expansion since launching a little more than two years ago. Crews will work over the next three weeks to install 91 stations, starting in Long Island City and ending in Bed Stuy by the end of the month. Then in the fall, Citi Bike will add 48 stations in Manhattan between 59th Street and 86th Street. Walder pointed to technological fixes his company has made since taking over the bike-share enterprise last October. Many of those upgrades are underpinned by Canadian firm 8D Technologies, which Motivate brought back into the fold, reversing the disastrous decision by Citi Bike’s original equipment supplier to dump the firm’s successful tech platform and build a glitchy replacement. “There was no way we could talk about expansion if we didn’t address the issues that were plaguing Citi Bike,” Walder said. The expansion stations are identical to those already installed in New York, with one exception: All the docks feature a new docking mechanism that automatically pops out a bike once it is unlocked. Along with 91 stations, Citi Bike is adding 1,400 of its new Ben Serotta-designed bicycles to the Citi Bike fleet, bringing the citywide total up to 421 stations and 7,400 bikes by the end of this month. 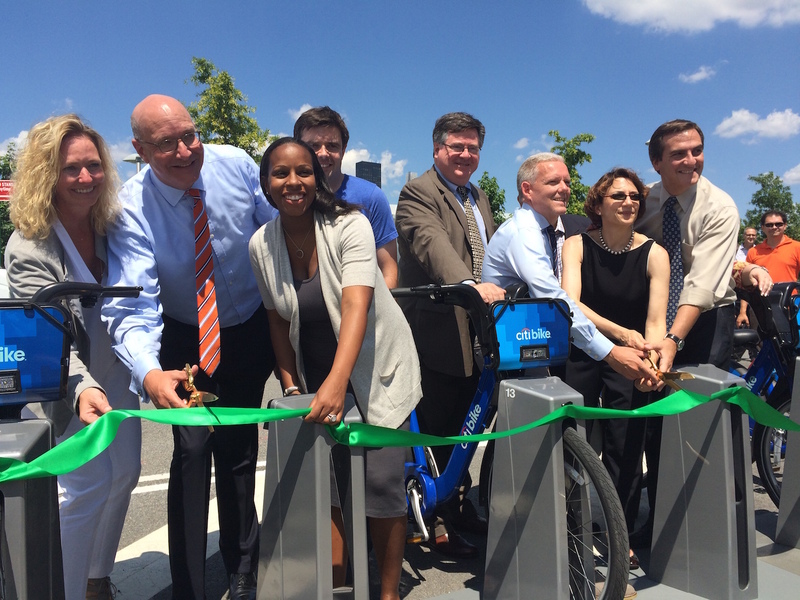 Yesterday, Motivate announced a 35-station, 350-bike bike-share system for Jersey City, launching in September, which will also be called Citi Bike. While users won’t be allowed to bring bicycles across the Hudson, customers of either system won’t have to pay extra to access bikes on both sides of the river. “It’s all within one membership,” Walder said. “What’s going in in Jersey City is exactly the same system. The only difference is the look of the kiosk. New York has a specially-designed kiosk.” Stations in Jersey City will look like those used for Motivate’s bike-share program in Seattle, with curved kiosk fronts and flat solar panels instead of the angular kiosks and pole-shaped solar arrays used in New York. To celebrate its New York expansion, Citi Bike is offering a $25 discount to new annual members who sign up before the end of August. Membership typically costs $149 a year for the general public and $60 a year for New York City Housing Authority residents. Trottenberg’s response is so disappointing. The failure of a sparse bikeshare network is foreseeable, not something we have to see in action before we then decide to do something about it. Build it right the first time, especially when we know how to do it. Oh, but her “homework assignment” is to touch every borough with bikeshare. Maybe we can install a single station in each, so she can move on to doing it right? Does anyone know why exactly New York has its own specially designed kiosk? Seems odd that Motivate’s kiosk design wouldn’t just be standardized across the board. Interesting — makes sense. Thanks! I really hope this roll out is mostly finished by the end of the month. Great news, but as of right now, there is literally only one station in Queens. hah! Well it’s a start… Probably one of the most inconveniently located stations to start with, but a start. Eh, they should have at least activated TWO stations so you can actually go somewhere on it without taking the bike on the subway or riding all the way to Metropolitan Ave in W’burg. A single station to joyride a bike there and back is not the concept of bike share. A lot of new users still don’t get this, so it’s something they need to focus on. Putting ’em on Governors Island is also confusing for ramming home the point of the system. The other 10 LIC stations are supposed to be online within days, and the Greenpoint and Williamsburg stations by the end of August. They are committed to (finally!) moving quickly. And the Hunter’s Point station provided a good backdrop for the press conference and is right at the East River Ferry terminal, FWIW. The elected officials who attended the press conference were so emphatically pro-bikeshare, pro-cycling and pro-Vision Zero (at least in words, if not in deeds) – it was a new level of enlightenment as far as the media-politico events I’ve attended. I couldn’t have imagined that we’d see so much unqualified support for the system when we were in the heat of the battle as it launched 2 years ago.